Originally designed by Sidney Myer for exclusive fashion parades and high society events, a wedding at Myer Mural Hall makes for a timeless and enchanting ever after. Art Deco in style and safeguarded by its heritage listing – Myer Mural Hall is a Melbournian treasure. Past visitors to Myer Mural Hall have ranged from royalty and government officials to private families. The happy couple decided to use our monet Collection to get people up on the dance floor. 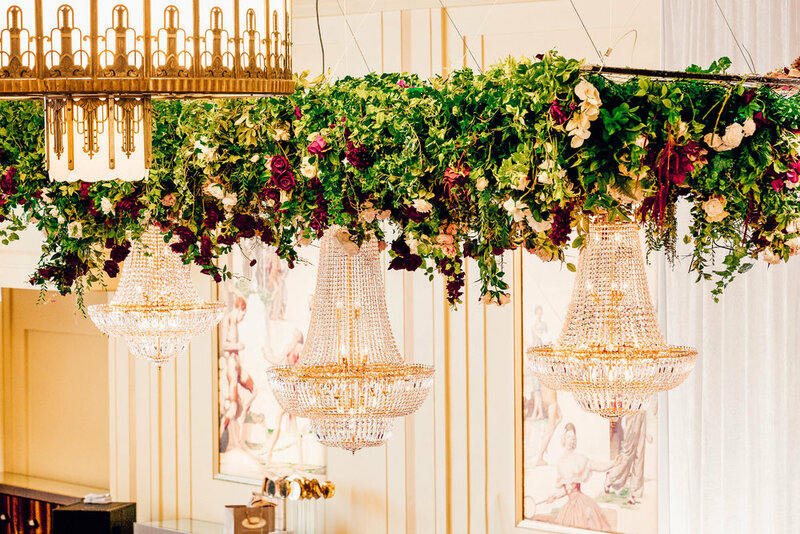 The happy couple decided to add a statement ceiling installation using a giant floral structure from Melbourne Event Florals using our Monet collection in classic gold. We used two of our medium chandeliers and one large statement chandelier in the middle to create a stunning ceiling arrangement for the wedding venue. Need something that has your guests exclaiming joyfully as they walk into your reception? Then look no further. The French knew how to throw a party and eat cake, which is exactly what you should be doing, under this chandelier arrangement of course! The Monet collection boasts the classic shape with brilliant beading work and cut crystal elements to really bring this chandelier design to life! Pair with our gorgeous fairy light garland strands and you’ll have yourself the most opulent looking affair in town. We couldn’t be more thrilled for our happy couple and hope they had as much fun at their wedding as we did helping them decide the details of their wedding ceiling installation. Looking for a statement chandelier backdrop for your wedding? Talk to us today to secure your spot for 2019.